General views of ground floor rooms. 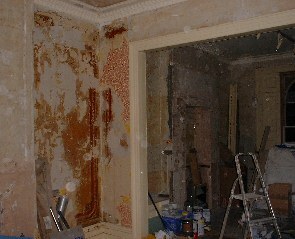 Corner of front room where wallpaper was investigated can be seen in the left hand picture. The ground floor of our house has two interconnecting rooms with an original arch. There would have been three folding doors allowing the rooms to be used separately but these are now missing. The cut down remains of one door had been used for the garden shed. This has now been preserved so that it can be copied. Original fireplaces and grates are missing and the back half of the room was until recently used as a kitchen. 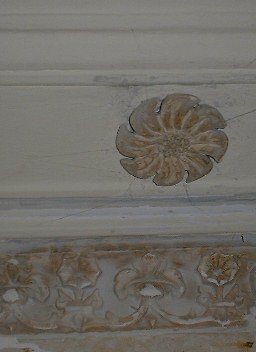 Original cornices survive (the results of a test cleaning can be seen below) but all the rosettes were missing in the front half of the room. Copies have been made from an original from the back room. 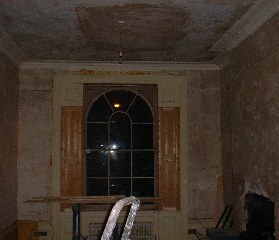 The room almost certainly would have had large ceiling roses but both are now missing. Original shutters were present in the back but not the front and some of the door architraves and skirtings are missing. 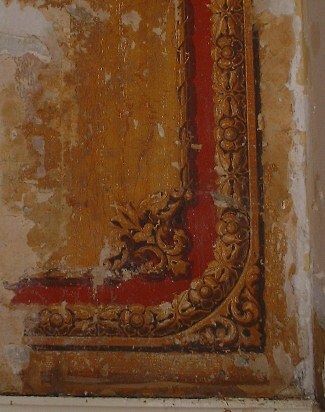 Poor condition of the plasterwork (left). 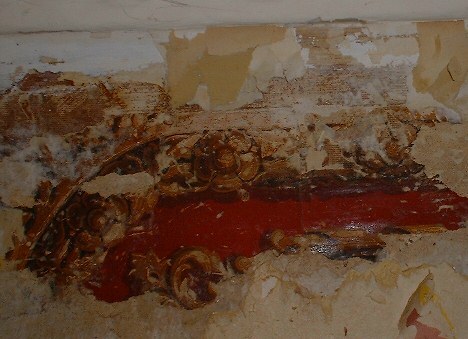 Traces of the old border can be seen above the skirting and (right) a test cleaning of the cornice. Rosettes are missing in the front half of the room. 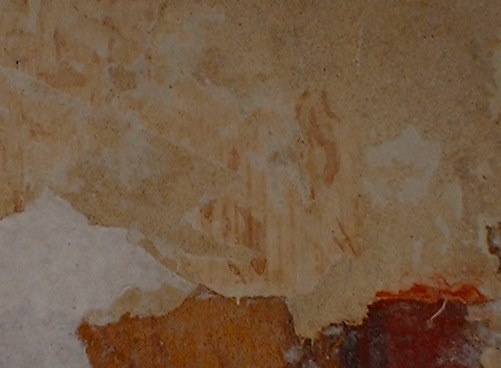 Because of the poor condition of the plasterwork the architect specified that the papers should be fully stripped before plaster repairs took place. 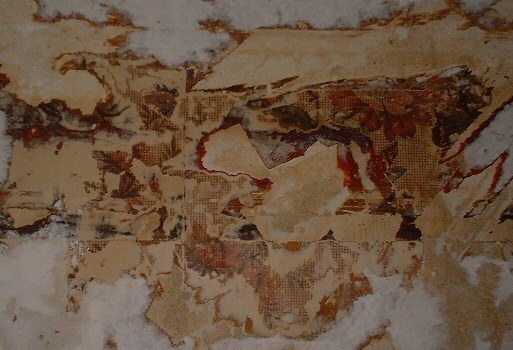 After the builders had started the stripping I noticed some fragments of earlier paper and I asked them to leave one corner of the room for me to investigate further. Two late 20th century schemes (left). The one with the fake marbling is earlier and had survived behind a fitted bookcase. 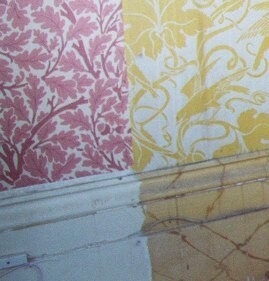 The ivy pattern (right) was only found behind kitchen cupboards, probably because it had been overpainted elsewhere. The top two layers of paper were late 20th Century, Morris type designs. Below that appeared to be lining paper painted beige. Under this all layers except one were very fragile and difficult to separate. There seems to have been a dark maroon colured paper and probably below that a floral design with a fine grid of horizontal and vertical lines simulating a woven fabric. Very few fragments of this had survived in the area left for me to investigate (see below). Fragments of a floral design incorporating a grid in imitiation of woven fabric. I now believe this to be the third layer from the wall. Below the floral design there appear to have been two more layers. Of the first layer I have only found one very small fragment. This shows signs of imitation oak graining, but in a much paler colour than that of the second layer (see below). The dark paper at the bottom of the picture is on top of the paper fragment in the middle of the picture. This paler paper seems to have graining lines and rays in imitation of quarter sawn oak. Of the older layers of paper the one I have had most success in uncovering is what I now believe is the second oldest layer. 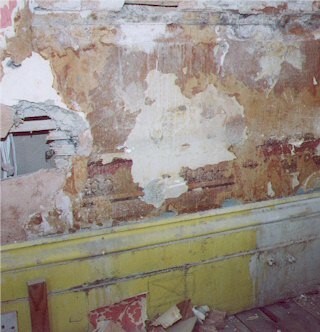 Before the room was full stripped it was possible to assemble enough evidence to reconstruct the complete scheme. Each wall surface was grained in imitation oak and surrounded by a border. 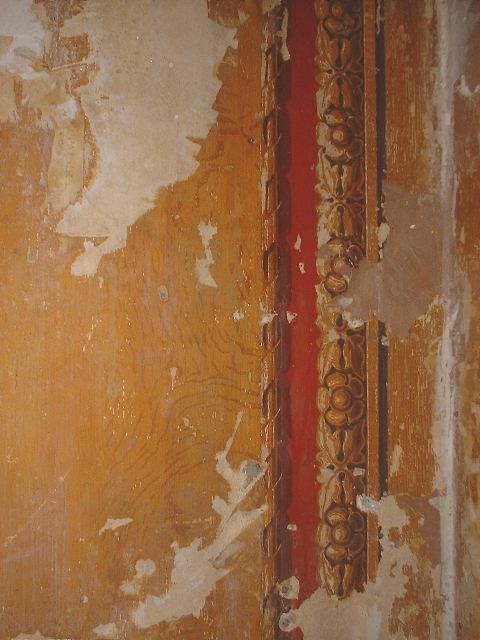 The border consisted of an outer band of oak graining then a trompe l'oeil architrave in red and oak. The border went along the top of the skirting, up the corners, along under the cornice and back down the corner. It did not go round the doors but stopped where it met the architrave. No original plaster or paper remained on the fronts of the chimney breasts but I guess it would have stopped at the mantelpiece in the same way as the doors. The walls have a painted horizontal line where one might expect a picture rail to be. If there ever had been a rail it does not seem to have been there originally as the border is continues behind it. I have now carried out some further investigation to examine the corners of the border and to see whether the shadows reverse on the opposite sides to complete the trompe l'oiel effect. The results can be seen below. The botton right hand corner of the border. The border and the corner are separate pieces of paper which have been stuck to the wall. The border has been rather crudely cut out but it blends in because the background colour matches the general wall colour. The top left corner of the adjacent wall. The shadows are different on the corner piece and reversed on the straight border, suggesting that a full trompe l'oeil effect was achieved. Regrettably there was little left at the top of the wall and all the remaining walls have now been stripped. It is possible that all four corners to the border would have been different. I would like to recreate the second scheme if I can persude my wife to live with it (she finds it rather vulgar, and I can see her point, but personally I don't really mind if it is). If my hypothesis is right, the scheme may date from nearer 1850 than 1840.